The first extensive application of the 12-around-1 whole-system framework is now active with the launch of the THRIVE Solutions Hub. The purpose of the hub is to offer people around the world a simple set of tools and processes that can provide a basic foundation for organizing to create solutions-oriented change where they live. There are many critical issues we must face in the world — locally, regionally and globally. To do so using a whole-system approach offers the best chance for truly effective and long-lasting change while also minimizing the challenge of creating unanticipated problems in other sectors when pursuing solutions specific to one sector. 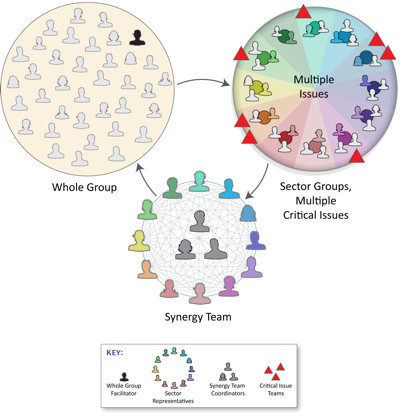 The illustration above shows the Whole Group meeting together in the upper left, then the Sector Groups having their own meetings to discuss the issues they're addressing (or they can all be working on the same single issue). 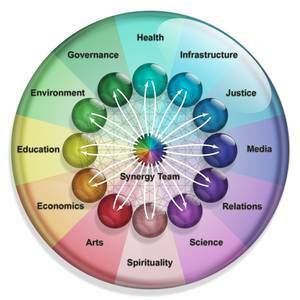 After they've met, the Sector Facilitators meet with a group of Synergy Team Coordinators, and all together this Synergy Team calls forth the collaborative potential within the Sectors to create greater efficiency and effectiveness. This team then reports back to the Whole Group. Likewise, the Sector Facilitators also report back into their individual groups what has been discovered and is desired to be implemented among the Sectors. These feedback loops are what makes the whole aware of itself, and each part (Sector, team, individual) conscious of its connection to and relationship with each other part and the whole. In the first two weeks following the launch of the Solutions Hub over 100 groups have registered to pursue such critical issues as GMO labeling and banning, water rights, chemtrails, health concerns, economic and political corruption, as well as to empower positive actions in their communities such as independent media, organic farming, new energy technologies, and much more. You can view and search for the groups by location, issue and sector here.